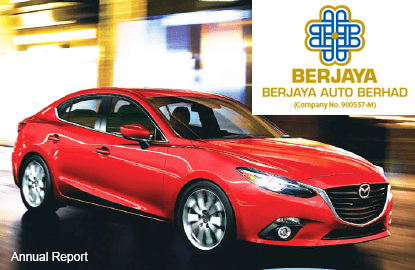 KUALA LUMPUR (Aug 20): Mazda vehicles and spare parts distributor Berjaya Auto Bhd (BJAuto) shares were up as much as 16 sen or 8% this morning to RM2.15, as Mazda reported a 36.4% growth in vehicle sales year-on-year. According to data released by the Malaysian Automotive Association, Mazda sales in July 2015 were at 1,333 units, from 977 units in July last year, registering a 36.4% growth while year to date Mazda sales grew 16.9% to 7,915 units from 6,771 units last year. In its note today, Kenanga Research said that among the investment merits of BJAuto is its superior growth prospect from low base on the back of a strong pipeline of exciting models, as well as its margin expansion on the back of a favourable exchange rate, with a huge exposure in yen. The research house added that another attribute of BJAuto is its potential dividend payout of 56%, which could translate into an attractive 7.3% dividend yield. “Following its recent share price weakness, the stock is currently trading [based on its closing price of RM1.99 on Aug 19] at an undemanding 7.7 times [2 year] forward price earnings (PER), which is at 23% discount to its industry forward average PER of 10 times,” said Kenanga Research. At 11.24am, BJAuto was trading at RM2.12, up 6.5% from its closing price yesterday with 2.79 million shares traded.